The post-war period in Vancouver was an exciting time for the arts community as a whole, a time when artists, architects, writers and theatre people often worked in collaboration. Gordon Smith felt that the Vancouver art community, with its experimentation with new ideas and abstraction, was at the forefront in Canada. 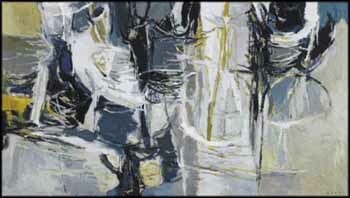 In addition to being stimulated by this ferment of modernist ideas in his own environment, Smith had traveled to San Francisco in 1951, where he was excited to encounter American Abstract Expressionists, including his teacher Elmer Bischoff and other artists, such as Clyfford Still and Richard Diebenkorn. This trip was a liberating experience for him, as he experimented with the physicality of new ways of painting. In Painting, Smith's use of gesture and the fluid creation of space dominate. Although this work could contain subtle references to landscape, which he never completely abandoned, Painting is really about the abstract qualities of form, space and colour, which Smith handles with assured ease.